Meshing bluegrass, country and gospel into a unique style of music called "sweetgrass", this album showcases original music and beautiful harmonies. 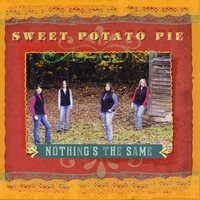 Sweet Potato Pie is an all female band specializing in bluegrass, country and gospel music. Playing traditional bluegrass instruments, the Pie is best known for their vocal harmonies and original music. “Nothing’s the Same” showcases the unique sound and talents of the band. Living up to their nickname, "Sweethearts of Bluegrass", these girls have crafted a musical treat that’s sure to please any listener's taste. Band members include: Sonya Stead - vocals & guitar, Missy Pyne - vocals & mandolin, Crystal Richardson - vocals & banjo, Ashley Davis - fiddle, and Julie Brown – bass. While the girls describe their music as "sweetgrass", their listeners just call it "lip smacking, toe-tapping good!" No matter what you call it, one taste of Sweet Potato Pie and you'll be asking for more.